This summer, Grayson Perry brings Provincial Punk to Turner Contemporary, Margate. Perry is one of the most prominent and incisive commentators on contemporary society and culture. His uniquely subversive art combines autobiographical reference, from his childhood to alter-ago Claire, with wry social commentary on class, taste, consumerism, war, and art versus craft. See more than 50 works in this focussed survey of Perry’s practice, only on show in Margate. From a young artist forging his own language in Thatcherite 1980s Britain to his work today, the exhibition explores the idea of ‘Provincial Punk’ as an anti-elitist and teasingly unfashionable spirit of creativity at the heart of his work. See an extensive display of Perry’s hand-made ceramic pots covered in drawings, handwritten texts and collaged elements, from Perry’s earliest pieces made in the late 1980s to the present day. Described as ‘stealth bombs’, these visually seductive and decorative pots touch on themes such as religion, childhood trauma and environmental disaster. Journey back to Perry’s early days in the post punk scene of 1980s London. See some of his earliest ceramics – a medium he embraced because of its ‘second class’ and uncool status, alongside previously unseen sketchbooks that mix confessional diary, sexual fantasy and political critique. Move through his rarely shown super-8 films, Bungalow Depression (created with Jennifer Binnie) and The Poor Girl, to more recent tapestries, such as The Walthamstow Tapestry and etchings, Map of an Englishman and Print for a Politician. From provincial to popular, Perry guides us through his chronicles of modern life, and in post-election Britain, helps us assess culture, identity, class and the role of artist and craftsperson from then to now. 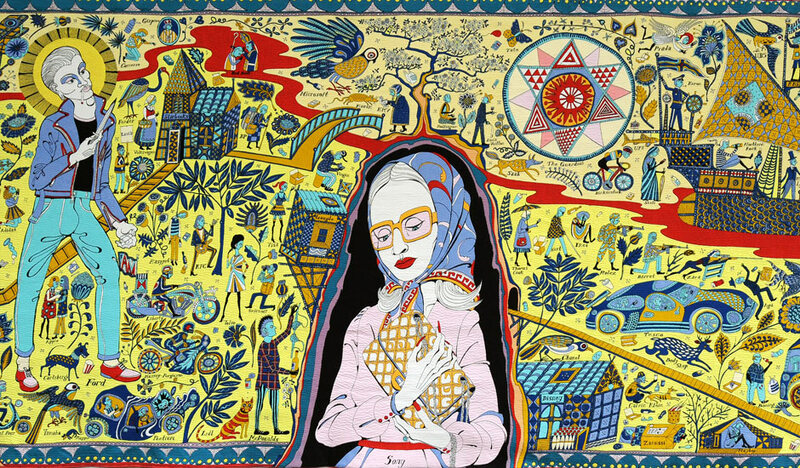 This entry was posted in Fashion & Textile Design and tagged Exhibition, Grayson Perry, Margate, Turner Contemporary, Winchester School of Art by Caitlin Hinshelwood. Bookmark the permalink.